Mark your calendars! This Wednesday, February 17, UGA&apos;s Grady Ambassadors present a show you don&apos;t want to miss. Rock it Out! is a concert benefitting Girls Rock, an organization whose mission is to build female youth empowerment through music education and creation. The concert highlights local bands and encourages support for young women to pursue music and find their inner strength. 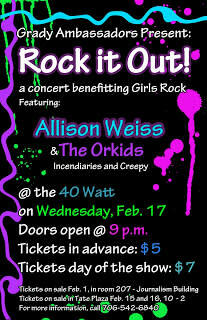 The 40 Watt will host the benefit for headline Allison Weiss and featured musicians Creepy, The Incendiaries and The Orkids. Tickets are only $5 in advance and $7 the day of the show- a small fee to pay for the great entertainment and contributions to an important cause. Concert attendees also will be able to enter a raffle for the chance to win a Daisy Rock Guitar or gift cards to Athens businesses and restaurants. For event information or to buy tickets, call 706.542.6840 or visit the Web site. We look forward to seeing you rock it out for a great cause!